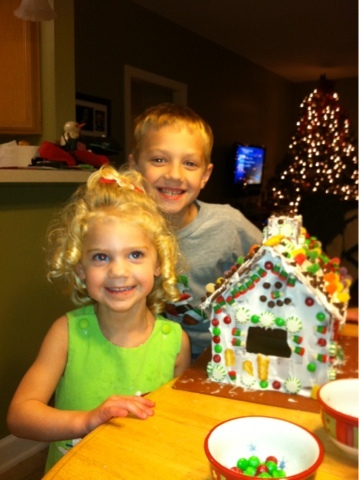 Prior to Christmas day, we have stayed busy with fun Christmas things. 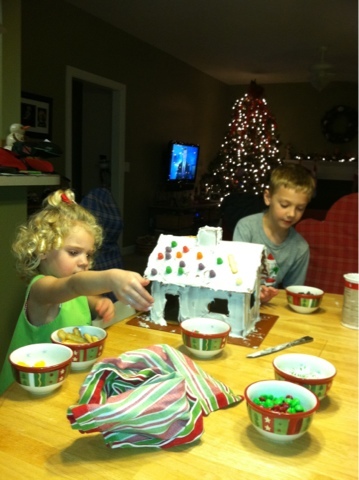 The kids has fun making a gingerbread house. I bought a plastic candy cottage that you frost, decorate, and then wash off to use next time. It was great. Abby is much more into that creative stuff than Carter. I am not sure how this is going to update as I am trying the app on my phone. 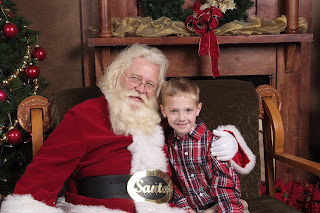 This year we wanted the traditional sit by Santa pose. 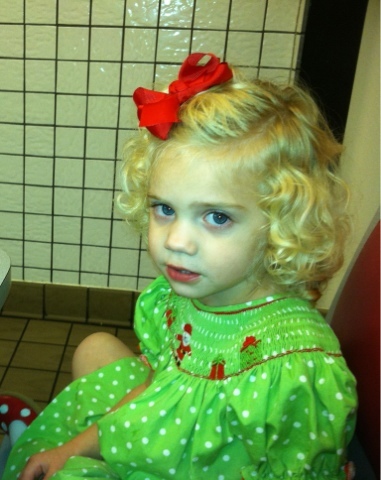 So after waiting for 3 hours, being next in line and Abby saying, I have to got potty as it was our turn. 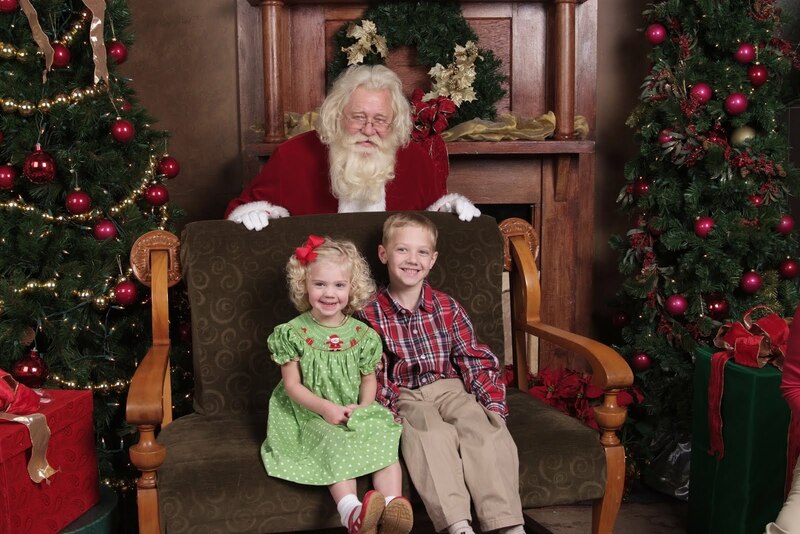 Abby had been so excited and said that she wanted to stand by Santa and then she freaked out. Abby and I walked away and Santa hid behind his seat. 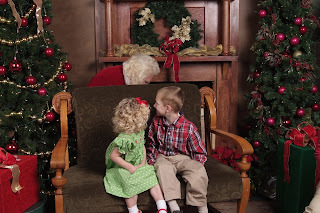 We got a few pictures with Santa behind the seat and then this is when we were busted... She started crying and then told him what she wants and gave him a high five with me holding her... Silly Girl. 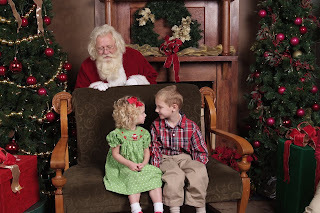 Brother and sister love with Santa. 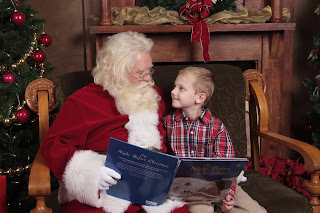 Well, I am a little behind in updating the blog and the month of December is almost over. 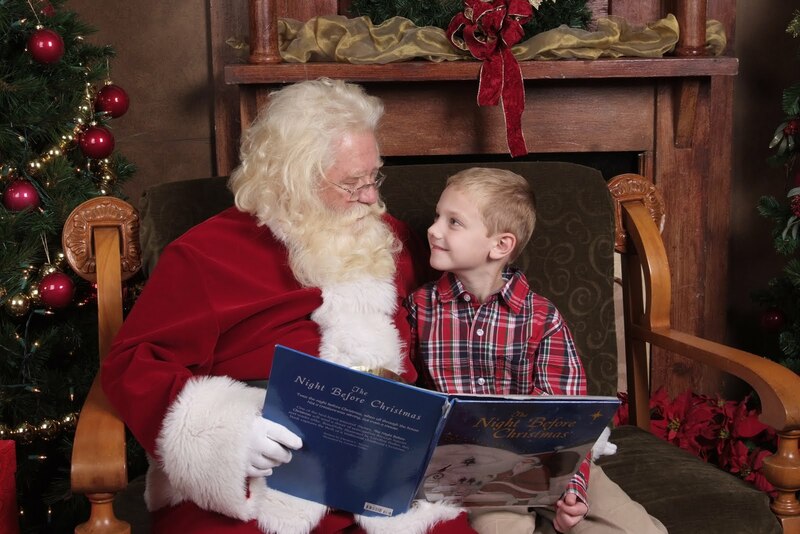 We have been busy with lots of fun Christmas activities and will be continuing the rest of this month. Abby had her performance at her school and her class sang Jingle Bells. She actually sang that night and has been signing Jingle Bells for over a month now. So sweet. Patrick's dad drove his Model A in a local Christmas parade with lights. Carter and his cousins rode in the car with Gramps and Abby, Patrick and I watched. All had a great time. Carter went to see Santa. Abby on the other hand was scared to death. She talked a big talk, but wanted nothing to do with him. Me with Carter and Abby. Trying to get pictures is one of the hardest things some days. I just love that sweet face..
Every year before Christmas we go to Build a Bear and the kids make Christmas animals and record their voices and then I put them away until the next year. It is so neat to hear how Carter and Abby sounded when they were little. I just love this tradition. I ended up being off on Halloween, so I went to Abby's class to help with the costume parade and trick or treating around the church. These kids had a great time. Such a sweet and silly girl. At least they are almost looking at the camera. Here they go all down the hall. The class in 8 girls and 4 boys and those girls surely have some spirit in them. The mermaid and her seaweed. Off the go to the next place for some candy. Here we have a cupcake, a fairy, a princess and a mermaid. I had so much fun getting to do this with Abby and am so lucky that I have a job that lets this be possible. Probably the most difficult experience of carving the pumpkin was trying to get Carter and Abby to take a picture together. They interact so much and like to tease each other that it makes for an enjoyable event. Let's try it a little different. 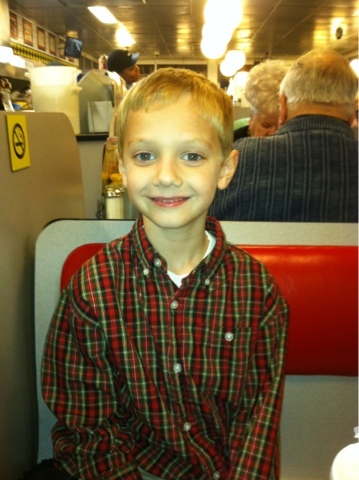 Carter looks so grown up. Abby loves this crazy pink pumpkin. She is still carrying it around the house. Carter drew the face on the pumkin that he wanted and then Daddy went to work. I think that increased Carter and Abby involvement will be the plan next year. So excited to see what Daddy is doing. All decked out in their orange for the fun Halloween month. We always go to McEntire, the base that Patrick works at for the fall festival. The kids have a great time and there is always a hayride that is lots of fun. Trying to get pictures of our mermaid and cowboy together was not an easy task. Abby with one of the balloon creatures that she got before it got popped. Outside on the hayride waiting to say trick or treat at all of the stops. Our sweet cowboy. We did several activities this fall time, so I broke them into several small posts. More to finish up the month of October soon. Abby and those crazy teeth again. Abby as a mermaid with the seaweed around her neck. She also has seashells in her hair. It definitely was not my finest sewing job, but it worked for Halloween. Carter and Abby with Gramps. The kids with their treat bags. Nana and Gramps with Carter and Abby.